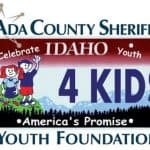 The Ada County Sheriff’s Youth Foundation provides opportunities for at-risk youth to participate in pro-social activities of their choice as a preventive to drug and alcohol abuse and gang involvement. It costs $45,000 a year to incarcerate a juvenile. It costs $480 annually to provide at-risk youth positive activities as alternatives to delinquent behaviors. In 2006-2007, the Youth Foundation served 275 at-risk youth. Students who participated in Youth Foundation activities showed significant improvement in their grades, school attendance and self-confidence. Statistics show that youth who participate in after-school activities are less likely to skip class, use marijuana and other drugs, smoke, drink alcohol or engage in sexual activity. In addition to suppressing criminal activity, ACSO also recognizes the critical need for prevention and early intervention. In 1999, Sheriff Vaughn Killeen, now retired, created this foundation based on his belief that crime prevention programs focused on youth are the key to developing safer communities. Our funding comes from two main sources, first the sale of the Youth License plate state wide. The second source of funding is through major sponsors/donations. How can I buy a Youth license plate? Go to your local Department of Motor Vehicles and ask for the “Youth” plate. On the specialty plate application check the “Youth” box. Or online, go to the Idaho Transportation Department specialty plates page and follow the directions. 100% of the money generated by the Youth plates goes to at-risk youth and programs that offer these youth activities during non-school hours to help prevent drug and alcohol abuse and gang activity. Do you have other questions? Contact Andrea Dearden at (208) 577-3318 or email adearden@adacounty.id.gov.